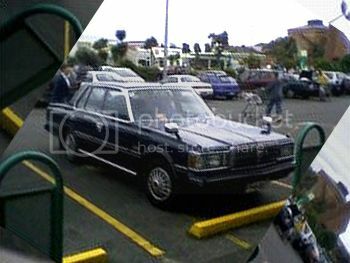 Toyota Crown, Tidy as a tidy thing. I apologise for the horrendous picture quality, it was taken on my phone and I thought that it was on a better resolution, sadly, it was not and this is what I ended up with. Despite how it might look.. all pixelated.. it’s not like that in real life and is infact the second tidiest Toyota of that size and era that I see kicking about down here. It’s parked in the disabled spot and driven by an old man. Brilliant. Classic & Retro. Oh Hey, retro-classics! Thanks to Alistair for the picture. Clicking it will take you to the 1024×768 version.